During the winter break, a group of students and volunteers, including several Auggies, traveled to Cambodia to teach English and to participate in service projects through the Global Connections Project. The group was led by Penh Soni Lo, director of Pan Asian Student Services at Augsburg and co-founder of the Project. The Global Connections Project was started by Lo and Shawn Tuoch, both children of wars that resulted in the mass exodus of Southeast Asian refugees to the United States. After several individual trips to Southeast Asia for charitable projects, Lo and Tuoch recognized the need for humanitarian work in the country. While in Cambodia, the group volunteered at New Life Center Organization orphanage in Siem Reap, which the Global Connections Project built in 2010. 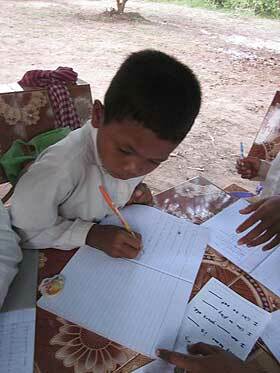 They also taught conversational English in Sonha village about 25 kilometers from Battambang. Below are reflections from four Augsburg students involved in the Global Connections Project. To read more, visit the Global Connections Project Facebook page and website. Today we got to visit the orphanage and words cannot describe how beautiful these kids are. They have a contagious spirit of laughter, joy, and excitement and they bring such a powerful energetic atmosphere! Their English is amazing and the kids were very helpful to my peers and I [sic] with our Khmer. Coming to visit and meet the kids brought a sense of encouragement and hope. It's so hard to not fall in love with these kids; they really have captured my heart today. We arrived last night to Siem Reap. On our 6-hour train ride from Bangkok to Siem Reap, I happened to sit next to Boun Nook. He is a 16-year-old Thai boy and was heading the same direction that we were. I asked him if he spoke English and he nodded his head saying he did. The funny thing was that he really didn't speak English. ...I took out my sketch book, [and] he drew pictures in my sketch book and then pronounced what it was. I listened to every word and then tried my best to enunciate the words. He corrected me when I didn't say it correctly. This event made me realized how much art can be used to express ourselves as well as relating to others. Also I learned that every stranger is there to help propel you forward so don't be a stranger and talk away. Communication with these students was difficult at first due to the language barrier and even now it is still difficult, but there are the small little things we do that gives us the bond. Laughing together without understanding one another is the beauty of building a relationship because we both know what are intentions are. I am teaching them English and at the same time they are teaching me Khmer. We are both giving and receiving and I find that to be amazingly beautiful. It's a good feeling to hear them laugh even though they are laughing at me. It's been about a week here teaching the students in Cambodia. Waking up, doing chores, eating breakfast, biking to school, teaching the students in middle school, biking back home, teaching some younger students back at the center and then biking them home. These children are so bright, curious, engaged, and have brought definition and meaning to my life here in Cambodia. I know I will miss my students when the time comes, but for the time being I will focus on the time I have left here and how to use it best, to benefit my students. Although I am supposed to be teaching them, they have taught me just as much back. My relationship with them has grown and I hope to develop it even more before I leave. Besides a relationship with my students, I have grown and learned even more about my peers and advisor. Without their support and encouragement I wouldn't be where I am today. I woke this morning in a strange but familiar place. The sounds of the monks chanting morning prayer echoed over the loudspeaker. I stare at the ceiling of our hotel room expecting to see our our students rush in shouting "good morning, teacher!" I slip in & out of sleep as I thought I heard our oldest daughter say "Daddy, wake up!" And I woke up with tear drops missing home, but also a smile and a sense of renewed wholeness as we begin our journey home.